The annual Sneak's Birthday Beats event is back again for the 14th time, bringing yet another top line up to Toronto, Canada. 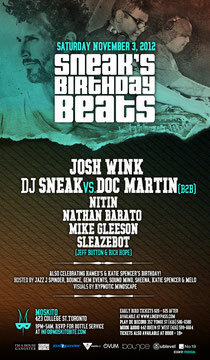 The 2012 installment sees Josh Wink joining the party, while Sneak goes back to back with Doc Martin for a an exclusive 4 deck 2 mixer set! Anyone who knows the long history these two have together are probably already getting excited, while younger house fans are in for a real treat as two of house music's pioneers lay down something very special. Also on the line up is Nitin of No.19, alongside Nathan Barato, Mile Gleeson and Sleazebot. This year’s Sneak's Birthday Beats takes place this Saturday, 3rd November, at Toronto's newest venue Moskito, boasting a capacity of 1000 split over two floors and a top of the range Alpha Dynacord sound system. 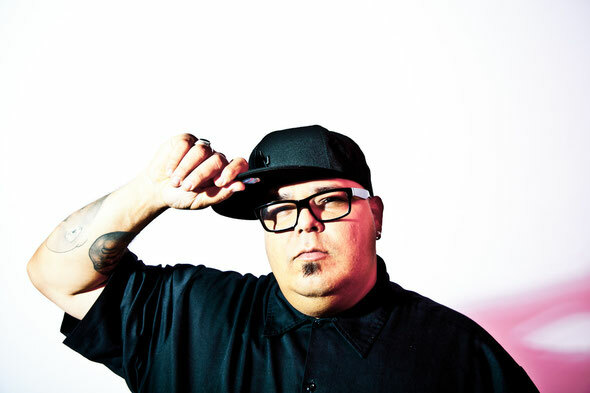 Since 1999 guests at the Sneak’s Birthday Parties have included Daft Punk, Basement Jaxx, Ricardo Villalobos, Luciano, Derrick Carter, Mark Farina, Francois K, Derrick May, Stacey Pullen and many others.